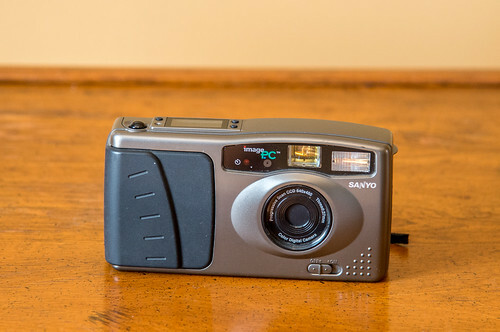 The Image PC VPC-G1 is a early digital camera released from Sanyo in 1996. Epson also sold this camera as the PhotoPC and as the Colorio Photo model CP-100 in Japan. It uses a fixed 43mm equivalent f/5.6 lens with a focusing range of 0.6m to infinity. Photos are captured in 6440 x 480 or 320 x 240 resolution. There is 1MB of internal flash memory. The memory can be expanded with a memory unit of 2 or 4MB. There is a built-in flash with a range of 1 to 3m. Flash modes include Auto, on, and off modes. Photos are composed with an optical finder. A green standby LED sits by the finder eyelet. It flashes when a photo is transferring to memory. Another photo can be capture only after this LED stops flashing. The top of the camera has a LCD display that has information such as battery level, flash mode, exposure counter, exposure remaining, resolution, and self-timer. A resolution, erase, timer and flash buttons surround the LCD. The erase button deletes the last captured photo. It requires a small pointed objet to depress this button. The erase icon will flash in the LCD when this button is pressed. Computer connection is via RS232 (9pin) serial port. 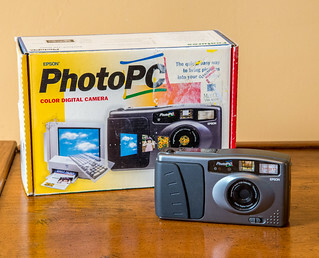 A Apple Macintosh compatible version was also available sold as PhotoPC Mac. It only differs by computer software and as well as including a 9pin to din8 adapter cable. There is a eyelet for attaching a hand strap. It is powered by 4x AA batteries located in the removable hand grip area. The camera automatically shuts down if there is no activity within 60 seconds (when connected to computer, software allows adjustment of this up to 5 minutes). This page was last edited on 3 May 2014, at 08:32.